2013 was year of ups and down for stock market. In January 2013 sensex started its journey from 19513 level & observed fall in August 2013, not only that sensex reached to all time high 21293 in November 2013. Currently sensex is on 20996 level. Soon we will be entering in to New Year 2014. With improvement in economic condition and business scenario we hope 2014 will be good year for stock market & investors. 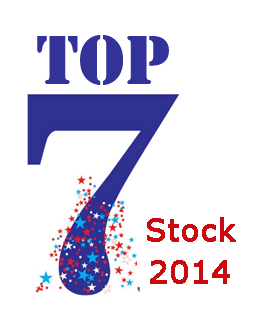 We are herewith top 7 multibagger stocks for 2014. HCL Technologies is an IT services company providing software-led IT solutions, remote infrastructure management services and BPO services. The company has a leading position in remote infrastructure management services which has helped it win large IT outsourcing contracts. In the current environment, we believe HCL Tech is well placed in terms of its business strategy. The results of the same are evident in its consistent outperformance in terms of volume and revenue growth. The company has allayed the apprehensions on the margin front by consistently improving its margins despite head winds. We recommend buying this stock with target of Rs 1350. Another stock pick for 2014 is also from IT space. TCS providing IT services & involved in outsourcing business from India. TCS is well established is known for services. TCS delivered robust financial & operational performance in last two years. Going ahead too, we believe the company is well positioned to capitalise on to the opportunities that the marketplace has to offer due to its scale. We recommend buying this stock with target of Rs 2600. Larsen & Toubro (L&T), the largest engineering, construction & infrastructure company in India, more or less L&T is a direct beneficiary of the strong domestic infrastructure development and industrial capex boom. Despite challenges like stiff competition, the company has given a robust guidance of 15% growth in the future. A sound execution track record, a strong order book and a healthy performance of its subsidiaries reinforce our faith in L&T. We recommend buying this stock with target of Rs 1250. Reliance Industries Ltd (RIL) has a strong presence in the refining, petrochemical and upstream exploration businesses. Recently we heard news that gas production from the Krishna-Godavari-D6 field has fallen significantly but with the government approval for additional capex, we believe production will improve going ahead. We recommend buying this stock with target of Rs 1010. Sun Pharma is growing rapidly in pharmaceutical space which is reflected from result 40% Y-o-Y revenue growth and 39% Y-o-Y profit growth in FY2013. With a strong cash balance, Sun Pharma is well positioned to capitalise on the growth opportunities and inorganic initiatives. Its debt-free balance sheet insulates it from the negative impact of the volatility in the currency market. We recommend buying this stock with target of Rs 660. This is pick from entertainment space. With increase in subscription revenue and growth we expect price of this stock to rise further. ZEEL’s management acknowledged that the recent TRAI recommendation of capping the advertisement time at 12 minutes per hour would have an adverse impact on its advertisement volume. The company will take adequate hikes in the advertisement rates in order to negate the impact of reduced volumes. Thus, we expect a very minimal impact on the blended advertisement growth in FY2014 and FY2015. We recommend buying this stock with target of Rs 310. Bajaj Finance has successfully evolved a growth strategy based on product diversification, geographic penetration, and cross-selling. Bajaj Finance is strong contender to receive a bank license and is best placed to transition smoothly into one. Bajaj Finance has an existing branch infrastructure and strong brand recall. We recommend buying this stock with target of Rs 1600. If you enjoyed reading this article, do share with your friends and collogues through facebook and twitter. Highly informative. Will surely circulate among my friends and relatives. Best of Luck for future endeavors.